In this delightful memoir, Jimmy R. Lewis does for the Ozarks what Garrison Keillor does for Lake Wobegon. Motivated by a desire to preserve the rich sense of place he experienced growing up there, and to inspire others to do likewise, Lewis chronicles the characters and events of two small neighboring Missouri towns from 1907-1960. Unlike Keillor’s fictional stories, Lewis’s tales are true. Personal memory and research provide the fodder for these 31 vignettes supplemented with photos and endnotes, and in a locale where croquet remained a popular but all-male pastime, the daily rituals of small town rural life come alive. The region, however, was not immune from external perils. Effects of the Depression and wartime service impact the area, and these more sobering stories temper the lighter fare. While not all the tales may seem individually significant, collectively they form a tapestry of community life that shows how its inhabitants confronted events both mundane and extraordinary. Throughout, Lewis’s colloquial style lends authenticity without sounding hokey. “No matter how much you achieve, it’s likely that you won’t be remembered very long,” the author reflects. In spite of, or perhaps in light of, that sentiment, Lewis has compiled an appealing and enduring love letter to Midwestern small town life of yesterday. 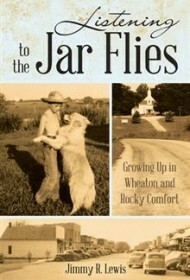 Readers will savor Listening to the Jar Flies. BlueInk Heads-Up: This book provides a rich source of local history and should be of particular interest to libraries and collections in the Midwest.